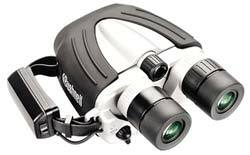 Bushnells StableView is a high-performance binocular that is perfect for extended viewing. The on-board Image Stabilizing technology neutralizes hand movements and offers two modes to choose from. Normal mode compensates for three degrees of motion - ideal for use in a moving boat or car. Fine mode dampens up to one degree of movement - significantly reducing hand tremors and the "shake" typical at higher magnification. Your view is stabilized instantaneously! Essential gear for birders, wildlife observers, big-game hunters and anyone who enjoys viewing nature.